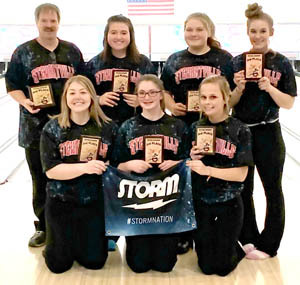 The Stewartville High School girls bowling team captured third place at the Minnesota High School Bowling Championships held at Colonial Lanes in Rochester on March 2. Tiger team members are, kneeling, from left, Ashlyn Brandt, Jalynn Colligan, Cobi Gowlland. Standing, from left, Coach Doug Farrell, Madelynn Kropp, Payton Rowley, Samantha Upham.